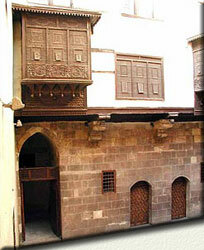 Manzil Zeinab Khatoun is one of the most remarkable houses left nowadays. Named after its last owner, as was the custom for Islamic houses in those days, it occupies a distinguished location at the back of Al-Azhar Mosque in "Atfet El-Azhary" (Azhary alley) in Darb Al-Ahmar district, once the finest and richest neighborhood of Islamic Cairo. Also found opposite the house is a well-known monument, Al-Ayni Mosque and at nearby distance, two other important houses, Bait El-Harrawi and Bait Sitt Wasila. Most of those houses had the same architectural design composed usually of a central open courtyard around which the rest of the house chambers are distributed, including the main spaces such as the "Salamlik" (men’s quarters) and the "Haramlik" (women’s quarters). Manzil Zeinab Khatoun, a fine example of the Ottoman era, was restored lately by Egyptian officials and now it is reused as a cultural centre were many social - musical activities and exhibitions are held. You can find the whole details in the following link.